For years now “experts” have blathered on about Horsepower – peak horsepower mostly. Eventually they started on about Torque, giving the impression that you can have one without the other. Of course this Nonsense. No dynamometer can measure horsepower. Dynos only measure torque. Horsepower is torque multiplied by engine speed, revs per minute in our case. In the nice friendly units that we all know and love; BHP and lbsft, we than divide by a constant, 5250, to get BHP (that’s why any dyno graph in BHP and lbsft will have the power and torque curves crossing at 5250 rpm). Everyone uses peak horsepower to sell products; from car manufacturers selling new cars to race engine builders and those marketing performance products... cams, exhausts, air filter, everything is sold on peak horsepower. How often are you at that peak horsepower? Very rarely. Then how often is that peak horsepower figure actually true? Very rarely. Only with the throttle wide open and only for a few hundred rpm will any engine ever produce its peak horsepower. What makes an engine quick is NOT peak horsepower – how often are you at peak horsepower rpm? What makes an engine quick is torque; in fact it is the area under the torque curve. To properly compare two engines, or one engine before and after mods or development, only the area under the torque curve matters. Our modified heads together with our camshaft profile specs will give more torque across the rpm range than any other head for a given valve size. Bar None! Stump pulling torque and high rpm torque is what will win races, NOT peak horsepower. Or products give a wide rpm band torque increase, we’ve coined the phrase “Wideband Torque” just to be trendy, but we mean it! Put us to the test... If your engine is not better than any other equivalent engine across the rpm range, with the same valve size and throttle size then your airflow work will be free of charge. More boost equals more power? Wrong! More boost just means that your head flow is poor and the turbo compressor can supply more volume than the head can flow, air backs up and pressure increases. The head has an equivalent orifice size which is too small for the compressor capacity. Port boring is all you need for turbo power? Wrong again! Air flows in much the same way at higher pressure as it does at atmospheric pressure; it’s just a bit thicker... So port shape is just as important at high pressure. Parallel port bores will give an increase but nowhere near as much as correctly shaped ports. We will flow your head to give unbeatable airflow and therefore torque spread across the rpm range, minimal turbo lag, none at all in some cases. Then we will specify your turbo to work with this increased head flow to give you an unbeatable package of head, cams, turbo all in tune. Make sure your gearbox can take it! Long inlet tracts create turbo lag? Wrong again! Inlet tract length after the turbo has no effect on boost lag. The pressure inside a vessel is a constant, the high pressure wave front travels at the speed of sound, fast enough to be instant inside any turbo system... Put your turbo in the boot, it makes no odds! 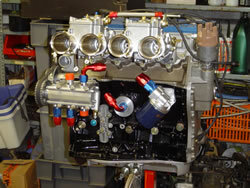 We are able to undertake development projects to increase the torque and power of any type of Race Engine, or high performance road engine, Ford to Ferrari, Pinto to DFV. We work in close association with engine dyno and rolling road services to give our clients the benefit of a fully finished and ready to race engine. 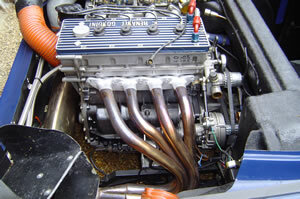 Our high standards are similarly carefully applied to rebuilding rare and classic road and race engines. 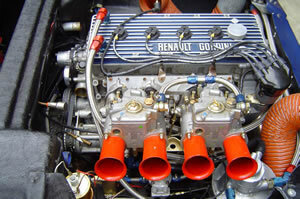 Rolls Royce and Bentley through to Alpine Renault Gordini F2 and Mercedes 300 SL, these are all engines that have been through our workshop recently in addition to the continuous throughput of Ferrari engines. We can also undertake specialist parts machining work if you are building your own engine, and bespoke manufacture of engine parts to your design or ours.